Every now and then we stumble across a place that we should have known about long ago. Whenever we do, we plan on sharing it with our readers. Korker Liquor is one of those places. It is a liquor store that we’ve driven past hundreds of times over the years, but never bothered to stop in… that is, until recently. Korker Liquor is located on the ocean side of Pacific Coast Hightway just north of the MacArthur intersection in Corona Del Mar. 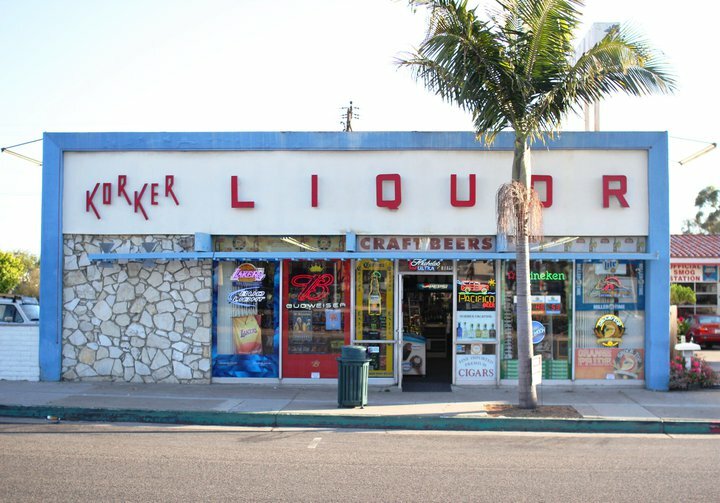 Seriously, if you’ve ever driven down PCH through Corona Del Mar, you’ve definitely seen Korker Liquor. If you look at the photo of the street view, just above the doorway… it says “CRAFT BEERS” in big bold letters. How could we miss that? Well, we did. Little did we know what else we were missing. Korker Liquor is a family owned and operated business that has been around since 2004. The move to make it a craft beer destination began about a year and a half ago, when the son, Garen decided to take the business that his father had built and make it even better. Now they have over 100 craft beer selections and they pride themselves on being a place that “beer geeks” will flock to. It’s important to me as a customer that the staff is friendly and open to talking about their beer, and it’s obviously important to Korker Liquor as well. I complimented the guy behind the register, ( I didn’t know know it was Garen at the time), about the amazing craft beer selection as I brought my Drakes Denogginizer up to the counter. That sparked a conversation about other beers in the fridge, which led to talking about the updates on Twitter and Facebook pages when new stuff comes in, etc., etc. Instantly, I went from a curious passer-by to a customer for life. Full disclosure, Garen didn’t know I was a beer blogger either, he just thought I was a regular customer. So kudos to Garen and Korker Liquor for treating the average customer with the utmost respect. I was amazed at the selection of beer in the fridge wall. 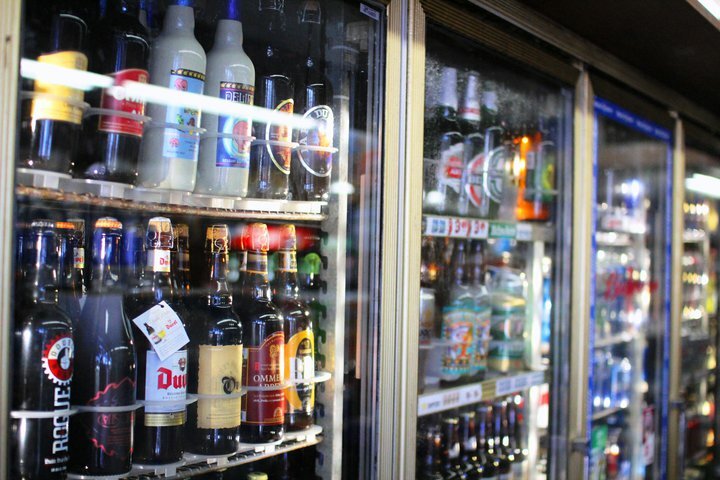 Beers that seem to disappear immediately from the shelves of other stores that I shop, are prominently displayed in the beer fridge at Korker Liquor. Beers like Infinium, Sculpin, Knuckle Sandwich, Stone Collaborations, etc. are posted on the Korker Liquor facebook page as soon as they are available. My first thought was, “Ooh, no one knows about this place, good for me…” My next thought was, “No one knows about this place?!? I’m gonna tell everyone!” So here I am, telling everyone. So do yourself a favor, next time you’re driving up or down the coast, stop by Korker Liquor in Corona Del Mar and treat yourself to some craft beer. You deserve it. If you’re on 4Square, check in and get a bonus discount. Garen is motivated to give folks like us a discount in order to gain a lifetime customer. When I mentioned to him that I was a beer blogger from Beer Soaked, he gave me the 4square discount. So tell him that you heard about Korker from our site, beersoaked.com, and I bet he’ll give you the local discount as well. As always, if you’ve got a favorite spot that you want us to check out, leave us a comment. This entry was posted in Craft Brew, Links and tagged Corona Del Mar, craft beer, Korker Liquor, store by Erik. Bookmark the permalink. Try the Wookey Jack! Firestone! Insanely good!